"The Ecomatic was the magical clutchless version. " 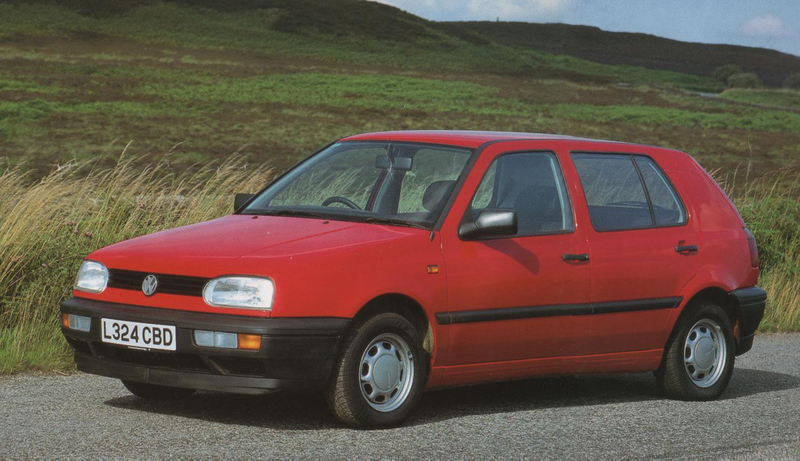 The Volkswagen Golf Ecomatic got its name from the words "Ecology" and "Automatic", and was produced late 1993 - mid 1994 with mention in press statements as early as 1992. It was ahead of it's time, and as a result was a sales failure with only approximately 4000 vehicles made. Stop-starts are now back in fashion, some not necessarily particularly superior as the principle of the Ecomatic. If you type "Golf Ecomatic" into Google, not a lot comes up, aside from part numbers from VAGCAT and foreign online parts systems. There also isn't a lot of information about what they are anywhere, so I created this site in an attempt to inform people of what the Golf Ecomatic is and how it worked. There are a couple of articles on the internet now about the Golf Ecomatic but weren't when I created this page back in 2009. Also most of the articles just rip off my webpage and the VW sales brochure which is totally evident in the fact the sales brochure contained loads of mistakes which you wouldn't know about unless you actually drove one. Clearly people are happy writing about things they don't understand these days, nothing new there then eh. Anyway on with the show, because I own three of them and 2 other Mk3s, this site is a bit biased, so don't say you haven't been warned. If you want to know about the individual components of the Ecomatic which enable it to perform the start-stop business, check out the forum or the Wiki. The forum is a little more up-to date. The principle behind the Ecomatic came from the simple thought that an engine need not run if no power is needed. As soon as you lift off the accelerator, the clutch opens and the car freewheels to let it glide under its own motional energy for as far as possible, the engine then switches off after a further 1.5 seconds of inactivity to save fuel required for tickover. When you then press the accelerator, the engine restarts right away, the clutch then closes (smoothly) and takes up drive and off you go. This was pretty clever for 1994! Aside from the fuel saved when the engine is off, the freewheeling enables you to travel quite far distances in overrun as opposed to if the engine braking effect was occurring, it takes a lot of getting used, to get the best out of the freewheeling effect, as well as learn to use the brake more as the car tends to "run away", but once you have mastered it, you can start doing many "free" miles. VW decided that the most appropriate engine for the design was the 1Y diesel engine, straight forward, non-turbo diesel engine. According to the brochure, this engine was used because it was an almost instantaneous starter, as well as having a good fuel economy from a diesel engine (of course). Naturally, the car wouldn't have had much point if it was a petrol variety which offered less fuel economy than the diesel models. Automatic freewheeling and an engine switching off in motion couldn't be done with a conventional manual gearbox of course, so a manual gearbox with an automatic clutch was used (semi-automatic). A little odd as you would expect a fully automatic transmission, but the probable reason is that at the time the only automatic gearbox available was one based around the torque converter design, which wouldn't have given the car as good fuel economy, in addition to the fact that Volkswagen did not tend to fit their diesels with automatic gearboxes around that time. a vacuum pump to provide vacuum to the clutch positioning valve (the vacuum system is actually quite clever, it works like this: it has a priority switching valve so that when the engine is running, the clutch vacuum is generated from the mechanical pump on the diesel engine for the brake servo, to take the wear off the vacuum pump motor, however when the engine is switched off, or when the door is opened, if the clutch vacuum is insufficient, the valve closes and the electric vacuum pump starts up to top up the clutch system, if the brake system runs out of vacuum reservoir, the engine is immediately restarted to top up the brake servo in a swift manner via the mechanical pump, the engine then provides vacuum for the brake system solely, and the electric vacuum pump has to provide vacuum to the clutch circuit, when the vacuum for the brake is restored, the valve then opens and things carry on as normal). In short, contrary to what some (including the brochure) say, the electric vacuum pump provides vacuum to the clutch system only. An electronic power steering pump to ensure steering is uninterrupted when the engine is off (there is no engine-driven pump), this pump switches on if the vehicle is moving, providing the ignition is on, an auxiliary coolant pump to keep hot water circulating round heater matrix (and engine) during switch off to ensure the blower continues to run without any heat drop-off on long periods of the engine switching off, this runs as long as the ignition is on. A larger battery to cope with long periods of switch off (92Ah), a more powerful than normal alternator (90 ampere), and an auxiliary battery (9Ah) to provide power to the lights (to ensure they do not dim), and other systems when the engine is being cranked, (and a control unit to manage the switching of batteries too). Along with various other sensors and control units to aid functioning of the systems. The heart of the system is the "digi-swing" (or DIGISWING) electronic control unit (under the water deflector, where the ECU normally is) which manages a lot of these systems, including clutch and engine management. The digi-swing controller masters the clutch operation via signals to the clutch positioner (with a fuzzy logic adaptation), switch off routine, outputs to the switches, control of the starter motor, and also has a pretty good self-diagnosis capability too. It suppresses the oil pressure and alternator warning lights when the engine is switched off. It even turns the engine on should the brake servo run out to top it up should you be going down a hill and exhaust the servo. And so it should - the point here was not a crude stop-start system to inconvenience the driver, but to make driving the car a seamless experience. The instrument cluster also has 3 additional lights: An orange "Ecomatic control lamp" to show when the Ecomatic is disabled (via the switch on the wiper stalk), this prevents the Ecomatic from freewheeling and also stops the engine turning off, you can use this at busy junctions or when you need the engine brake. A second orange "Gear display control lamp" which comes on to tell you when you should change up, and flashes when you must change down (this even takes into account throttle position, therefore if your foot is flat down the light won't come on as soon as it knows you require the lower gear), generally, this light only flashes as a reminder you are in a way too high gear, not really as an indication when you could do with changing down. The light also flashes if a gear is not properly engaged. The third is a green "Engine running control lamp" which comes on to tell you when the engine is not yet in a state to be switched on and off (it is too cold, or the battery voltage is too low, or a fault has been detected, such as the brake servo vacuum pressure is too low). It should be noted that the green lamp goes off after 1 or so minutes into the journey, so you benefit from the stop-start pretty quickly. The Ecomatic can be disabled by pushing a button on the wiper stalk, in this mode, the car does not freewheel when the accelerator is released, and the engine does not switch off -- you can also restart the engine by pushing this switch at anytime. In this mode, because the clutch is not opened when the accelerator pedal is released, a switch inside the gear lever is used to determine when you are trying to change gear, when this switch is activated, providing the accelerator pedal is released, the clutch is opened, and you can change gear, the clutch is then opened until the switch is released AND the gear monitoring switch is reporting the gear is correctly engaged. Therefore, when the Ecomatic is switched off, you must grab the gear lever in the "correct" position and move simultaneously as you release the accelerator, otherwise the clutch will not be opened. Of course, in normal operation, you don't notice any of this, but this is the technical workings of it. Whether the Ecomatic is on or off, the clutch is of course automatically opened when you are going at a speed which would cause the engine to stall, as like a normal driver would use the clutch, for example, you could come to a stop in 3rd gear, and the clutch will open as you come to a stop, the gear change indicator would flash, and the clutch would not close until either 1st or 2nd is selected (the digiswing unit is programmed to allow you to pull off from a stop in 1st or 2nd, the gearchange indicator lamp will flash if you do this in 2nd gear however). In this manner, it is not possible to stall in an Ecomatic. It is sometimes possible to stall if pulling off in 2nd gear, however, the control unit detects this and restarts the engine and re-attempts the clutch operation. All 3 lamps flash at the same time for 10 seconds if a fault is detected with the system, at minute intervals, then the green light comes on permanently to stop the engine switching off, freewheeling behaviour remains on. Driving the Ecomatic is fun, the freewheel allows you to coast for distances you never thought were possible, without using up *any* fuel, probably how the motor vehicle should have been designed in the first place. There is also a smug feeling you get from the car that the clutch is automatic, as well as the look from people when the engine starts and stops. As well as this, this car must have had hundreds of thousands of pounds invested in it, and for these reasons, you cannot help but love it. The Ecomatic from chassis number 1h-rp-491791 can run on Rapeseed Methyl Ester (RME) (biodiesel) corresponding to DIN 51606 (EN 14214). I believe this was due to a change of the type of fuel lines used. A few people on forums have made assumptions with regards to the life of the starter motor. Actually, because the starter motor is used for literally no longer than a second at a time, even when starting in the very cold, there is minimal heat generation, even if in heavy stop-start traffic. Obviously the starter motor can be expected to fail sooner than it might on a normal Golf, but not at a particularly excessive rate because there is never any excessive heat generated. If you car radio is losing power when the engine is restarting, you need to replace your auxiliary battery - mechanics don't know it is there. The battery costs around £25 £35! It is easy to fit, it is behind the air intake pipe. An initial start with the ignition key is required. The engine does not switch off until the coolant temperature has exceeded 40°C, this usually takes about 2 minutes of driving. (Ecomatic mode is still on, as the car still freewheels). 1st gear: Engine switches off if vehicle has been stopped and the accelerator pedal has not been operated within 5 seconds. 2-5th gear: Engine switches off if accelerator has not been pressed for 1.5 seconds, any gear, any speed. Except if you have recently applied pressure to the gearlever (or changed gear) the control unit delays the engine turning off for an additional 5 seconds as it believes you are changing gear. If vehicle is stationary, engine will only restart by accelerator pedal if 1st gear is selected. Neutral: Engine switches off if gearlever switch has not been activated for 1.5 seconds; engine switches off regardless if you are pressing the accelerator. Reverse gear: Engine does not switch off, if engine is off and reverse is selected, engine immediately switches on. Driver's door is opened: Vacuum pump activates - if it appears to "run twice" this indicates a problem and this should be fixed in order to prevent the pump burning out. Ignition on, engine off in Ecomatic mode with gear engaged, and the driver's door has been opened: Neutral must be briefly selected and 1st reselected before engine will restart. More information can be found on the Forum. Drop me an email if you want to chat further - since this gets spammed heavily though it might take a while for me to reply. © 2009-2018 deylan.co.uk - Please link back to my page when quoting, I need all the visitors I can get - don't just rehash parts of my page and write your own article without linking back here please, it is very obvious when this page has been copied.